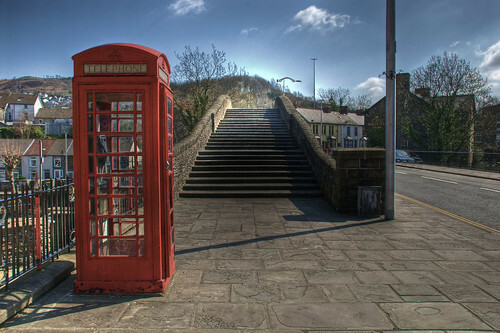 I’m from Pontypridd, know the area well, and the sites of your picuturs, I must say, they really stand out. 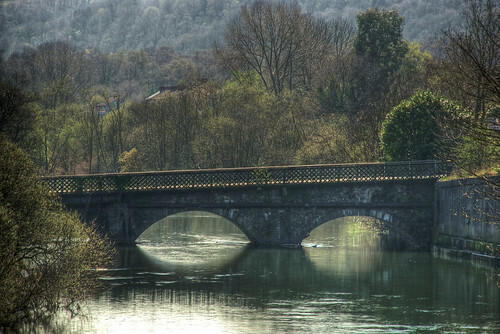 I like the way you’ve set the angle for the old bridge over the Taff. But yes, the photo you have of the bridge opposite Castle Street does look grand. will be watching for more photos in the future. @roy: many thanks. I’ll definitely check out your blog! Doctor’s Bridge or Machine Bridge at Pontypridd is a three-arched stone viaduct over the River Taff, extensively remodelled with later accretions and carried one carriageway of a road, which formerly carried Dr. Richard Griffiths’ Tramroad connecting collieries in the Rhondda Valley, via the Doctor’s Canal , with the Glamorganshire Canal . A weighing machine for coal trams was installed nearby hence the local name given to the bridge.I believe it is listed as the oldest railway bridge/viaduct in the country. As mentioned earlier it was remodeled and widened to take the road. This widening used a concrete structure attached to it’s southern side.The steel structure found attached to the road surface was to strengthen the bridge so it could cope with modern traffic. It is ironic that it was the newer part of the bridge that could’nt cope. 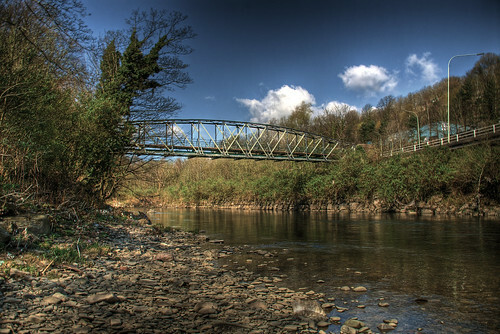 The concrete structure found on the side of Machine bridge was of a design and technology that links to another bridge on the Taff. It is obvious from the photograph of the Llancaich railway bridge that you used it as a vantage point, but you do not appear to have photographed the bridge you stood on.Perhaps you did not appreciate it’s technical importance. 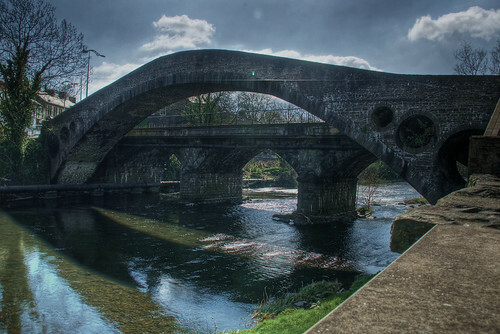 It is one of several reinforced concrete bridges in S Wales built on the system developed by the well known French engineer Francois Hennebique, who lived in S Wales for part of his life and was for a time the French consul for the area. The bridge has a central span of 116 ft and side spans of 25ft. The width of the parapets is 26ft. 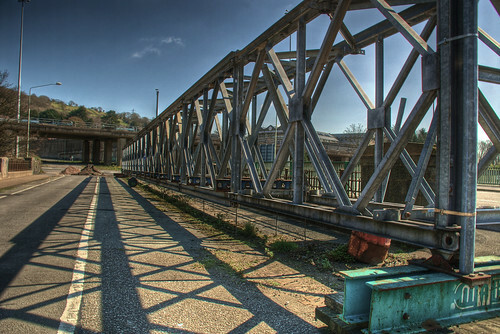 The main span has three parabolic arched ribs at 12ft centres, braced at intervals. The longitudinal beams supporting the deck are supported by columns off the ribs over the outer thirds of the span, the arch itself serves as direct support to the deck over the middle third. The side spans have their outer main beams arched to match the center span.I know that reinforced concrete bridges are an eyesore, but when the bridge was built it was revolutionary! 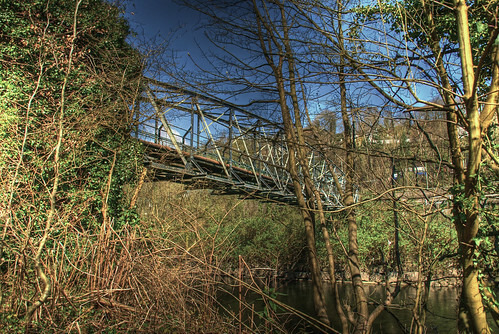 The Abercynon Iron Bridge is a bit of an enigma. I know there is a dated plaque bearing the date of 1850, but I have seen photographs and engravings circa 1900, showing a different bridge in this position. the bridge is wider than the present footbridge. Certain evidence for this is the size of the abutments on the Taff Vale Park side. These are a lot wider than the present bridge. [See what went under here? ].As well as leading to the canal the bridge also serviced Glyntaff halt. 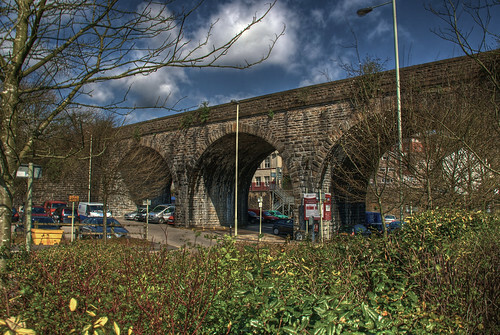 I REMEMBER THAT THERE WAS A RAILWAY BRIDGE AT THE TOP END OF BROADWAY THAT TOOK THE LINE FROM PONTYPRIDD RAILWAY STATION ACROSS TO PENTREBACH ROAD WHERE THERE WAS ANOTHER BRIDGE AT WHAT WAS THEN GLYNTAFF SIDINGS AND A DEPOT FOR FYFFES BANANAS. THE LINE CONTINUED ON TO CAERPHILLY AND NEWPORT. I BELIEVE THAT THERE WAS A” HALT ” AT DYNEA. THIS WAS IN THE 1950s PRIOR TO THE MOTORWAY BEING BUILT. Quite by chance, I have been looking over some old books of Pontypridd. 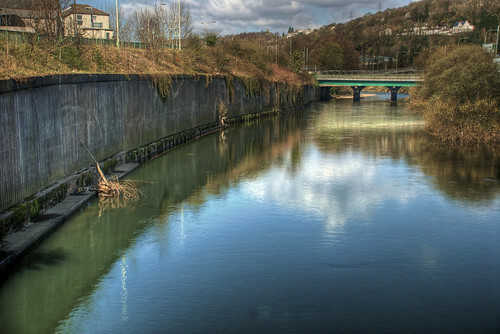 In one,”Victorian Pontypridd” by Don Powell, there is a photograph of the old Glamorgan canal looking south towards Glyntaff. 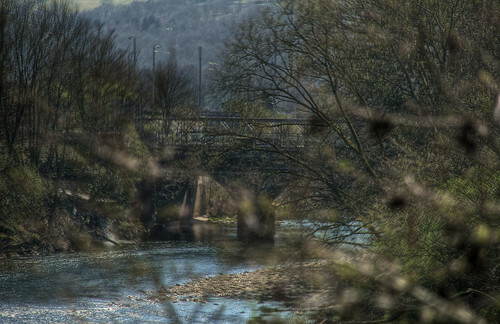 In this picture, it can clearly be seen the old Abercynon Iron Bridge. This is from a different view to the photographs I remembered, but clearly shows, that this bridge is of a different construction to the present structure. It is more boxlike in form and wider. I have no idea, when this bridge was replaced or why? An engraving of this area was also on the RCT History web site. 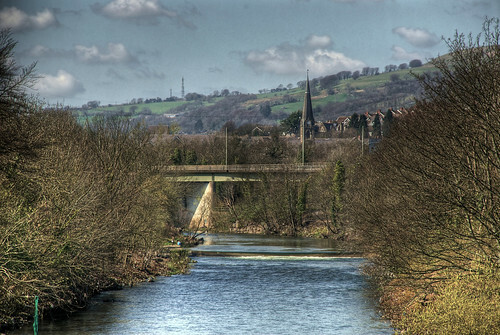 Nice use of HDR Stuart. Enjoying your photography and reading your blog. 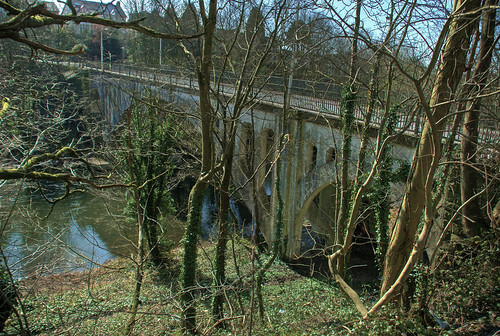 The three arch bridge is localy known as Castle Inn bridge (Pub) and was origialy used to carry a dram road i belive conecting the Tin Works canal to doctors canal, and the bridge by the round about is known as the Machine Bridge the machine being the weigh bridge for road haulage. 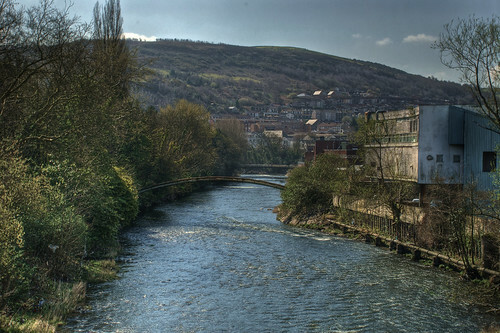 I must say, these photos of my home town are stunning, a pleasure to look at, will done, it show Pontypridd in its best light. The way you catch shadow in the photos is brilliant. 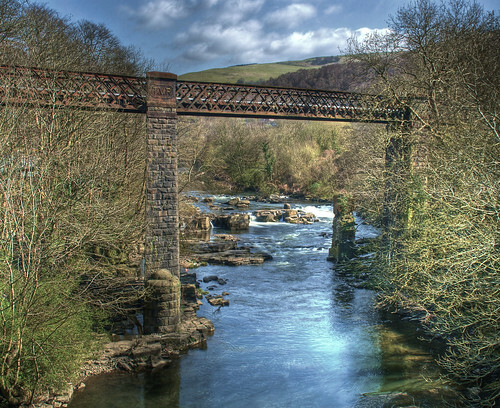 After much searching I have managed to find a photo of the original Abercynon Iron Bridge. If you use the link below it shows a picture of the original bridge in the bottom right hand corner. 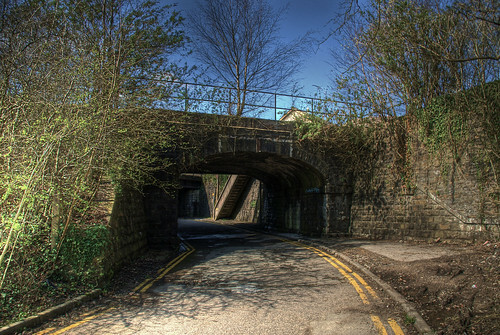 The bridge leads onto the canal and the original Glyntaff halt can also be seen.